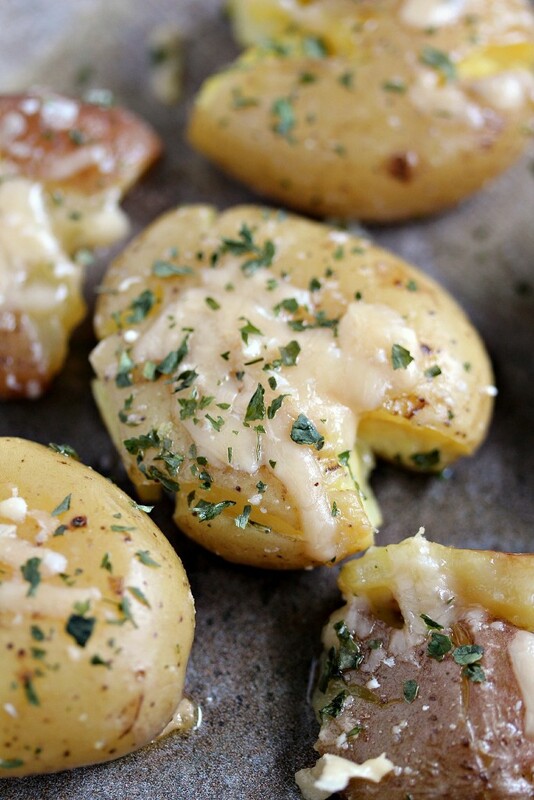 Parmesan smashed potatoes are a family favourite in our household. They’re a great alternative to mashed potatoes for the holidays, or all year long. Okay, I’ll admit it. I’m totally addicted to Smashed Potatoes. So when I heard we were celebrating Thanksgiving with a Sides to Share event for Food Fanatic I just knew these Parmesan Smashed Potatoes would be the perfect addition to the week long event. I’ve been making smashed potatoes for what seems like forever. My daughter tends to be a picky eater but she absolutely LOVES smashed potatoes. So I’m always whipping up variations on the recipe since she wants to eat these 3 times a week. 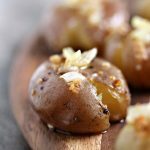 You can check out my recipe index for my Fried Smashed Potatoes with Onions and Meyer Lemon Dressing. That one just so happens to be my personal favourite. I can’t stop making them, they are SO good. If you dig through my recipe archives you’ll also find a recipe for Smashed Potatoes with Bacon. Told you I loved Smashed Potatoes and have been making them for what seems like forever. I’m a serious smashed potato fanatic. I’m whipping up another surprise version for you soon. They are totally original and a cool spin on another recipe of mine that all my family and friends always ask me to make. I can’t wait to share it with you! 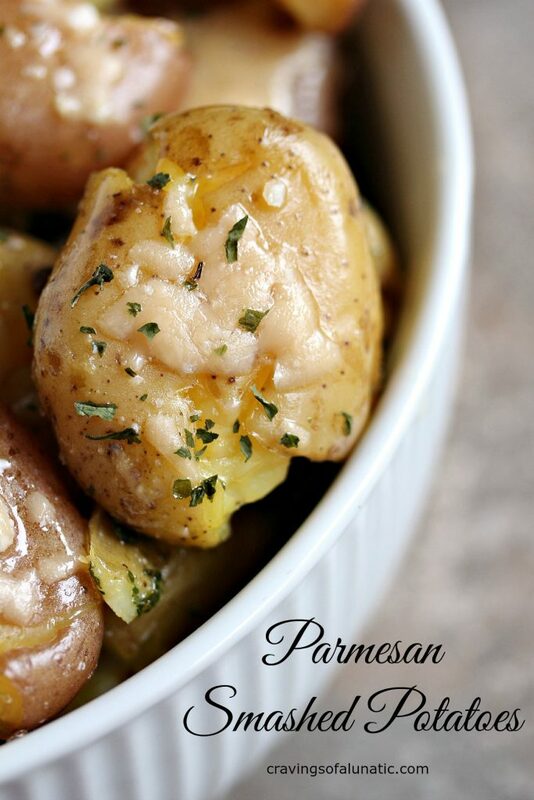 Until then you can make these fabulous Parmesan Smashed Potatoes, or any of my other Smashed Potato Recipes. 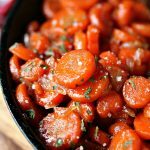 You can peruse through my Side Dish recipe index to see lots of other options for sides to share with your family and friends. I know right. You just want to stick a fork in there right now, right? 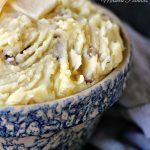 I adore smashed potatoes and I still have never had one LOL! But look at them–they are clearly amazing. I think the reason I have never made one is because I am pretty sure I would never stop eating them. These look fantastic. Thanks so much Laura. Ha, you need to try them. They are so good. Crispy on the outside and soft on the inside. Absolute perfection. My daughter is addicted to them. 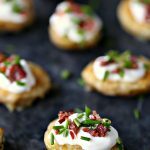 I LOVE smashed potatoes but have never topped them with cheese before – genius idea! Thanks so much Sara. You have to try them. 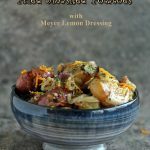 The Meyer lemon dressing has me drooling!!! They look so lovely, they are some pretty potatoes! I loved that recipe too. It’s pretty darn good. 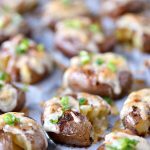 These smashed potatoes are right up my alley!! My family would love these!! Thanks Rebecca. We’re huge potato fans here so I make them way too much. 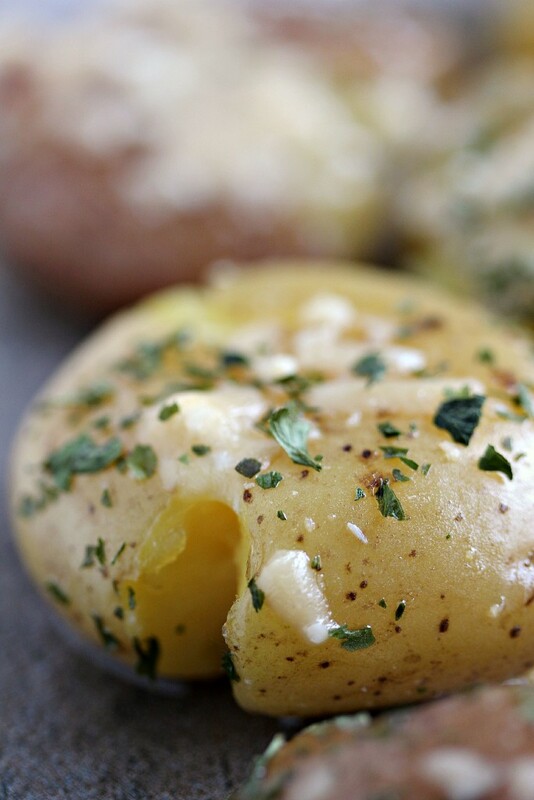 My daughter and I were just looking at this and agree these smashed potatoes look soooooo good. YUM. Thanks Sarah. We eat way too many smashed potatoes. My daughter is a huge fan so we practically eat them daily. I’m getting quite a list of flavours to post about. I think we’ve racked up 25 or 30 flavours now. It’s insanity. Oddly my daughter likes them plain. I’d have 10 recipes on my blog if it was up to her. Ha. You had me a potatoes. LOL And I love the dressing! What a fantastic combo! Thanks so much Dee Dee. Those are some spectacular spuds! I could seriously eat smashed potatoes every meal of the day without complaint. I love those suckers in any form. Especially with all this CHEESE! You are so my people. Ha, thanks Kirsten. I love people who love smashed potatoes as much as we do. They’re do dang good. K could eat them every single day. And tries to. 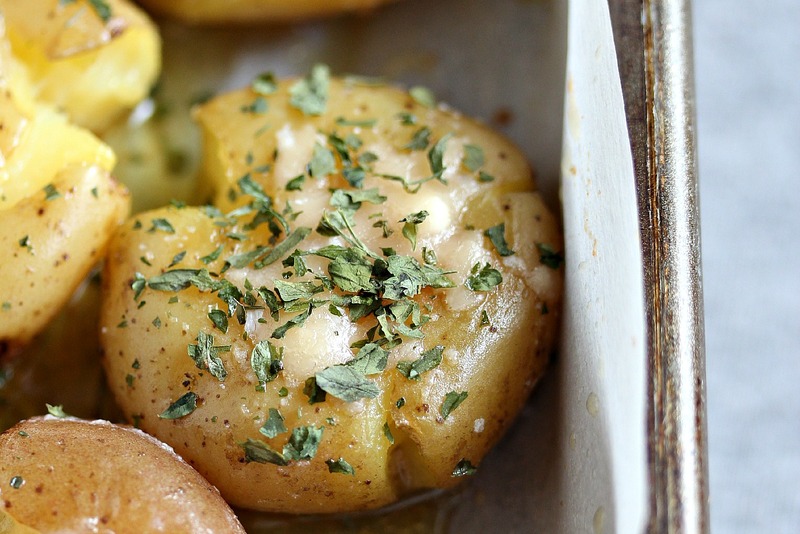 These potatoes look beyond amazing! I love potatoes in almost any form but this might be my most favorite. Please pass them my way! Thanks Brandy. I’m a sucker for smashed potatoes. K loves them so I make them multiple times a week. She likes them one way all the time but I need variety. So I split the batches and experiment like crazy with the other half. It’s so much fun. I must have 25 or 30 varieties in my file. It’s crazy town. 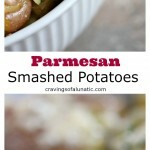 Now I’m normally a mashed potato girl but I could totally get behind these Parmesan Smashed Potatoes! Thanks Angie. I’m a big mashed girl too. So I make like 3 or 4, or 10, different kinds of potatoes on holidays. It’s insanity but I can’t help myself. These would vanish in an instant on my table! We love our spuds, and these look incredible. Ha, thanks Heather. We love ours too. Spuds rule the world. I’m actually not a fan of mashed potatoes. This recipe is more my speed, love parmesan! That’s awesome. I love all potatoes but scalloped so I can totally relate. Dear Kim, your potatoes look fantastic! What a perfect winter side…perfect for the holidays too. Thanks so much Catherine. I love these potatoes. They’re so yummy! and I love potatoes, other fact. Me too. It’s so darn good. I’m a potato fanatic too. I could eat them every single day. And usually do. These look like they are crowd-pleasers! Yum! They go over really well at parties. I make them every time we have company.